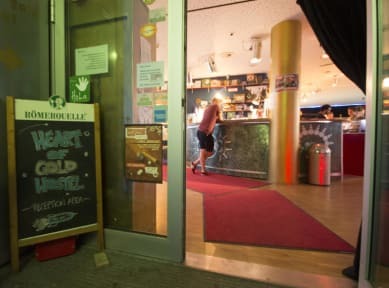 Heart of Gold Hostel is located just off Friedrichstrasse, a short walk to Alexanderplatz, Museum Island, Brandenburg Gate and the Bundestag. This hostel has spacious and clean rooms and a common room which is 'great for meeting other travellers with a game of pool and cheap beers', according to Hostelworld guests, who also say they'd recommend it to friends. We like their colourful and unique murals. 旅行住宿當中，這是我最喜愛的住宿，地方夠大，有多部電腦可使用，coffee n milk 任飲，staff 相當helpful n nice !! 有機會一定再住!! The hostel is clean and tidy, the location is great too. All great. Only downside is you need to bring your own lock for luggage storage. There is a kitchen, but the using time is not convince for me, even if the open time is 09:00-23:00, we have to wait the door open until 09:40. Except for that, the stay in Heart of Gold Hostel is good. The security is really bad. All of my ID and money were stolen in the room. The notice of don't use combination lock is too small, I can't see it when I was checking out. The staff in the reception is not so helpful about I loss my things. Too noisy in the night. Not recommend.